These are commonly known as sugar ants, grease ants, and a few other derogatory names. They are small, black ants about 3/32nd-1/8th inch long, often found in kitchens, bathrooms, and other areas related to moisture sources. They are particularly attracted to sweets. When crushed, they emit an odor not unlike the smell of blue cheese. (Click here for more details.) Common nesting sites included substructure crawl spaces, along foundations, and occasionally underneath concrete slabs. They have been known to occasionally nest in wall or ceiling voids. Colonies of these ants can be very large and often involve multiple nests. While these ants can be problematic on a year-round basis, our experience is that they tend to be more severe in the winter months (if temperatures are consistently above freezing) and spring months than other times of year. Infestations can occur in structures regardless of their age. Buildings newly constructed, or in the vicinity where new construction is occurring, can become infested when colonies are disrupted by construction excavation. 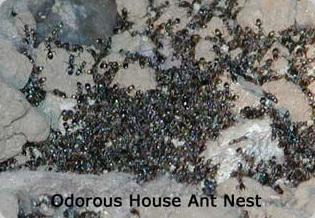 Additional academic information on odorous house ants can be found by clicking here. Corrective measures: Proper sanitation, such as cleaning food spills and garbage promptly, and keeping sweets in sealed containers, is paramount. Homeowners may be able to control small invasions of these pests with bait products such as Terro®. In persistent or widespread infestations due to multiple nesting areas, professional pest control services may be required to reduce the ant population through regular, ongoing treatments with short-term residual products. This biological grouping encompasses a wide range of ants that include the Western thatching ant Formica obscuripes (which create mounds of humus, twigs, etc. to nest in), California red-and-black field ants and brown field ants (typically nest in small mounds or under concrete slabs). Some species can bite in a manner similar to velvety tree ants. Additional academic information on thatching ants can be found by clicking here. Corrective measures: Various over-the-counter products are available for limited control of these pests. Where population numbers are severe or where structural infestation exists, Leupitz Pest Control can provide professional control services to meet your needs. Thought to have come to North America from Africa, Pharaoh ants can be an acute problem in hotels and inns as well as apartments and homes. These ants generally come into a structure via items shipped or brought in from an infested location. In the Pacific Northwest, the climate is too cool in the winter for them to survive out of doors. Inside, they can nest in wall voids, behind baseboards, under furniture, or under stored items in cabinets or closets. Food sources range from sweets to protein-based foods. Pharaoh ants are extremely small compared to native Northwest species; workers averaging 1/16th inch in size and light brown to gold in color. Corrective measures: Spraying for Pharaoh ants with residual insecticides generally will result in fragmentation, and thus spreading, of the infestation rather than elimination. Resist the temptation to spray. Baiting is generally the most—and only—effective means of elimination. Control measures to eliminate Pharaoh ants can take six months or more and are best left to the pest control professional. Leupitz Pest Control has had successful experience in controlling Pharaoh ants and can assist your home or firm if such a problem occurs.